Founder of the Town of Digby, Nova Scotia, Canada. Admiral of the Royal Navy Fleet, Honourable Robert Digby, was born on December 20, 1732, the third son of Hon Edward Digby and his wife Charlotte Fox. As a younger son, Robert having to make his own way in the world entered the Naval Service as a young lad of twelve or thirteen. Reasons for choosing a naval career are not clear as there was no naval tradition in the family at this time. Robert flourished and became Captain of the frigate “Solebay” in 1755 when he was only 23 years of age. The following year he was posted to the “Dunkirk”, a 60-gun ship and in 1788 he was promoted to the 74-gun “Ramillies” and patrolled home waters in Palliser’s division. The following year Robert was appointed one of the tow Rear Admirals in Rodney’s fleet and was given command of the flag ship “Prince George”. Under Digby’s able command, these ships engaged in many battles and by 1779 he was again promoted; this time, to second-in-command of the Channel Fleet. On 15 June 1779 he received into his company as a midshipman Prince William Henry, the future William IV, son of George III. On being asked how the ship’s company should address him, the young prince is said to have replied, “I am entered as Prince William Henry but my father’s name is Guelph and therefore if you please you may call me William Guelph, for I am nothing more than a sailor like yourselves.” In December of that year, his fleet sailed with Rodney to the relief of Gibraltar. At the same approximate time, he was distinguished as Governor of Prince William Henry. In later years, when the Prince left his naval career to become King of England, his excellent record as Naval Officer was attributed to the training he had received under Admiral Robert Digby. 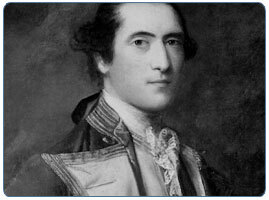 Robert continued his service with the Channel Fleet until 1781, when he was appointed Admiral of the Red and given the command of the Americas Station and arrived in Sandy Hook, New York on August 24 to take up his new post. There he found his predecessor, Thomas Graves, about to try for a second time to relieve Cornwallis, and Courteously refused to assume to command until Graves’ vain expedition was over. New York, where he took up residence, was in loyalist hands, while New Jersey was a stronghold of the rebels. Prince William, who was staying with Robert, heard of Colonel Ogden’s plot to seize the Admiral and his royal guest. Washington, who endorsed the plan, stipulated that no harm was to come to the prisoners. The British foiled Ogden’s plan. The British fleet then moved on to the West Indies where the war with Spain was now concentrated. The rest of the Admiral’s command in America was uneventful in political terms. It was during this time that Robert met Eleanor Jauncey, the widowed daughter of Andrew Elliott the lieutenant governor of New York. It must be said that his marriage, at the age of 44, came as a surprise to his family at Sherborne, that his bride should be a lady from America. Following the surrender of New York, Admiral Digby allied with Carleton, who demanded that Washington honour his promise allowing the United Empire Loyalists to leave the county “honourably and without molestation”. The pair blatantly informed then President Washington that if his promises were not kept they would resume hostilities without any further warning. They also stated they would not wait for formal permission from the London authorities. These two brave commanders saved thousands of Loyalists from a life of misery and possible death which, by all accounts would have been most brutal. Washington apparently took the commanders very seriously and the fleet of ships carrying about 1500 Loyalists headed for Nova Scotia. They arrived in Conway (renamed as “Digby” in 1787) in early June of 1783, with Admiral Digby commanding the ship Atalanta. Instructions for Captain Mowatt As the loyalists in general have requested that you might be appointed to protect them for some time, and as I think too much cannot be done for their assistance, you are to visit the Settlements at Port Roseway and in the Bay of Fundy frequently, and give them such assistance as they may require, and when this Service will admit of it, you are to proceed to Halifax to complete your Provisions. 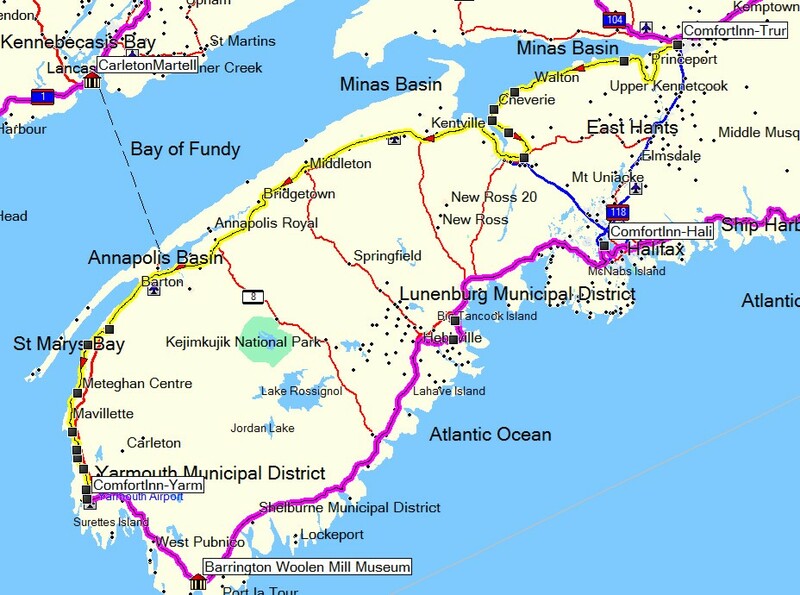 In order to proceed to Port Mattoon in Nova Scotia, as also ten half Hogsheads of Essence of Malt and six barrels of Sour [Krout], the last two articles as a gift to the Loyalists and Refugees lately settled there, the whole to be distributed under the direction of the Naval Officer that may be in that district. To Mr. John Delafons, Agent Victualler. In his diary he recorded in January 1790 “Received a letter from Bishop Inglis of Nova Scotia and the inhabitants of Digby Town acquainting me that they had again altered their plan and that the church was to be built of wood and therefore they cannot claim my donation of £150” and added with amusement “but the Bishop at the same time sending me a draft for the money in case I should choose to give it”. In September 1790 he noted in his diary “Received a letter from Lord Digby that Vice Admiral Darby was dead and that his death vacated the B(lue) Admiral of England”. Four years later he received the coveted promotion. Digby’s involvement with “his” Loyalists was far from over. He actively participated in the development of the new town. The citizens decided that they would honour him by asking the King to change its official name to Digby. The close proximity of the new town to his headquarters in New York facilitated water travel, allowing Admiral Robert Digby to settle here. The Admiral Digby Well is the only remaining structure indicating the location of his home. This well is kept in good repair with thanks to the Digby Horticulture Society. This site affords an excellent view of the harbour which would have allowed the Admiral to keep current with the activity of ships, people and supplies. In 1784, he contributed very generously to the building of the Trinity Anglican Church, also donating the bell which is still in use today. When the original building burned, a grave beneath it was identified as that of Digby’s only child, a daughter. It is believed that Admiral Robert Digby was here on many occasions during the period from 1783 to 1787 but was recalled to his home waters in 1787, being made Vice Admiral in recognition of his services in North America. His presence is noted in our town again in 1790. In 1794 he retired and was made Admiral of the Fleet – the highest of all British Naval ranks. During 1813 he made a lengthy visit and, no doubt, took great delight in the way his namesake town had progressed. 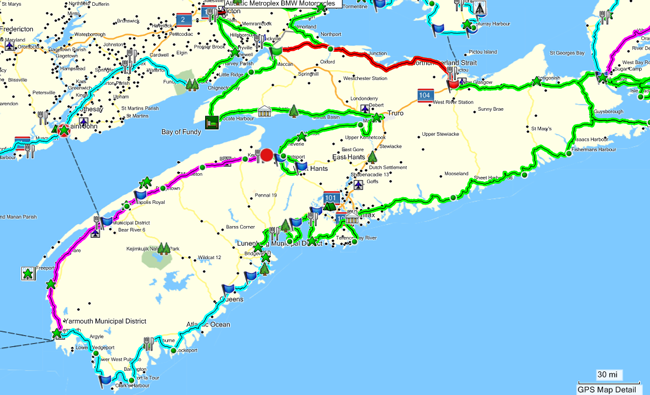 Cape Breton Island is home to four scenic travelways: the Ceilidh Trail, Cabot Trail, Bras d’Or Lakes Scenic Drive, and Fleur-de-lis/Marconi/Sydney Area Trails. The fabled scenery of Cape Breton includes fabulous waterfalls waiting to be discovered by hikers and explorers of almost all abilities. If hiking is your passion with a waterfall at the end as your prize, take the Cabot Trail through St. Ann’s to North River. The moderate-to-difficult 18-km (11-mi.) hike, round trip, is well worth the effort when you arrive at the 33-metre (100-ft.) waterfalls. It’s about a six-hour hike. 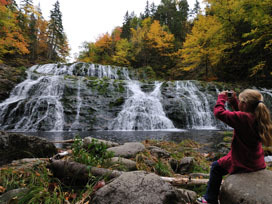 Less experienced hikers can proceed directly to Baddeck Forks and the trail to Uisge Bahn Falls. A moderate 4-km (2.5-mi.) hike though hardwood forest leads to these 16-metre (50-ft) high falls.